Adapted from Chef Waldy Malouf’s beefsteak recipe at the (now closed) Beacon Restaurant. 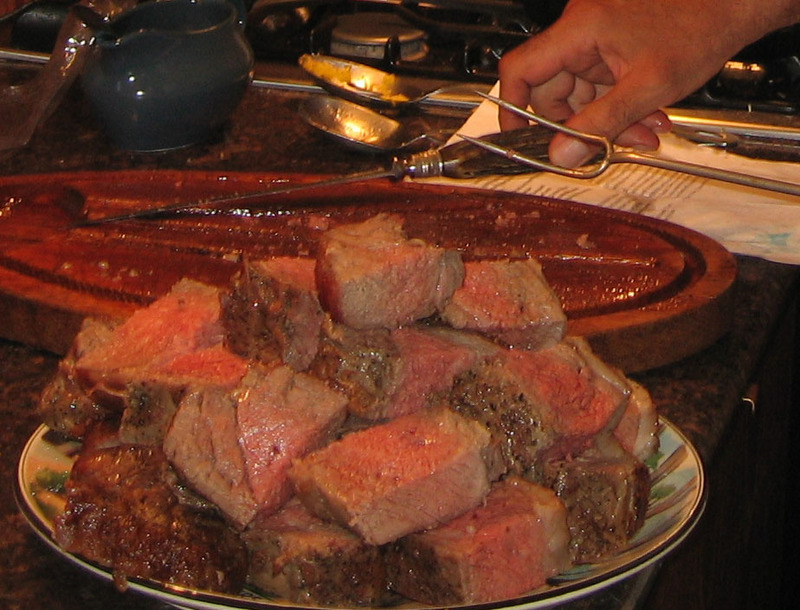 Throwing a “Beefsteak” is an old New York City tradition. It was a night of beef, beer and cigars with no vegetables or silverware. Preheat oven to 400 degrees. Season sirloin heavily with S&P. Place in a roasting pan, fat side down and roast for 30 minutes. Turn meat over, fat side up, and add onions to pan beside meat. Roast another 30 minutes. Remove roasting pan from oven. Turn oven off and leave door ajar to cool slightly. Transfer beef to a rimmed platter, leaving onions in pan. Loosely cover beef with foil and return to oven to keep warm. Carefully spoon off about two-thirds of the clear fat in roasting pan (leaving any dark juices beneath) and add beef broth. Place over high heat and boil until reduced by half, about 10 minutes. 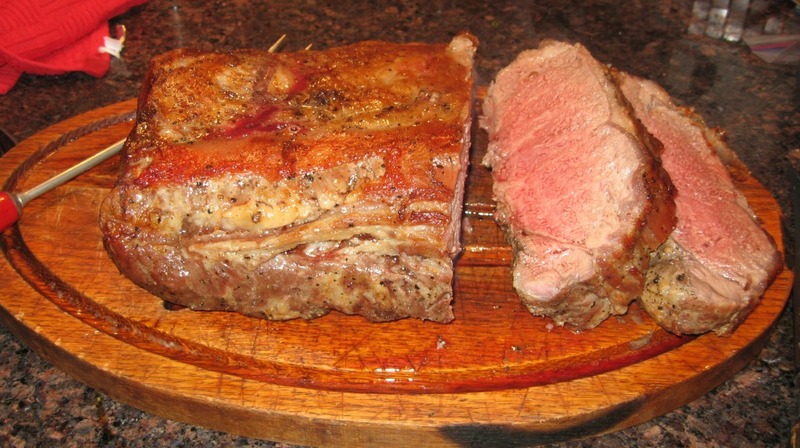 Add butter, Worcestershire sauce, and any juices that have collected in platter of beef. Return to medium-low heat and simmer for 10 more minutes. Strain sauce into a warmed pitcher or serving bowl. To serve, slice sirloin into 1 1/2-inch-thick steaks and then cut each steak crosswise into strips 3 to 4 inches long that you will be able to pick up with your hands. Serve sauce very hot. Dip meat into sauce as you eat. You can also serve meat with a stack of white bread. This is worth the trip to the butcher to get the correct cut of meat! Yum!! !